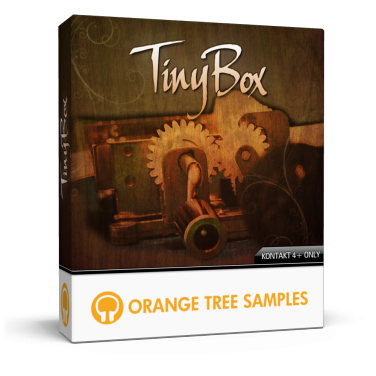 TinyBox™ is an extensively-sampled 15-tone music box, covering nearly 3 octaves. A rarely sampled instrument, TinyBox adds a unique element to your compositions, whether you write rock/pop songs or soundtracks for various media. TinyBox features 14 alternate samples per tone and two sets of samples: clean and dirty. The dirty sample mode emulates the mechanical noises that occur during a music box's performance, while the clean mode isolates the pure tones of this instrument. We've also included both tuned and untuned sample modes as well. TinyBox is capable of everything from pure, bell-like tones to raw, detuned plucks. TinyBox is powered by a KONTAKT script which allows you to adjust the amount of pre-roll sample used (the sound of the tine being pulled back milliseconds before the actual pluck occurs), stereo width, and other factors. It also allows you to double, triple, and quadruple the instrument with a single control, including additional options to adjust the humanization, tuning, and panning spread between these multiple instrument voices. - 694 MB of samples, compressed down to 314 MB with KONTAKT's lossless NCW format. - Sampled using Korg's 1-bit/2.8MHz recording technology, then converted to 24-bit 96khz, providing exquisite sound quality. - 14x round-robin alternating samples. - Clean / dirty samples, with tuned / untuned option. - Adjustable pre-roll samples for added realism. This product requires a total of 630 MB of free disk space in order to download and install the sample library. The total size of the download is 310 MB, and after installed the library occupies 320 MB.